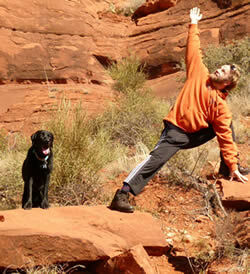 I am heading back to my roots today with Steve Rubin and Ashtanga at Full Circle Yoga. I have also been trying to go back to my roots over the last couple days with my mantra. 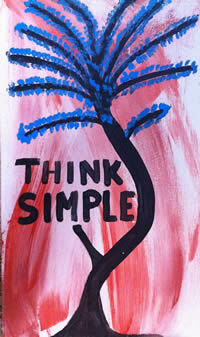 I painted the above picture a few months ago to help me keep focused on what I feel complicates many of our lives. It seems like the world spends most of their lives worrying about things that complicate their lives. For instance people who have no money worry about getting more money. People who have money worry about how to spend their money, or they own more things to worry about. People often make the mistake that the more money they have, or the more things they have that they will worry less and be happier. It is not what we have, but who we are. Our society builds this worry into our brains. Life can be as simple or crazy as you make it. When you wake up in the morning it is where it starts. How many of us wake up like a Maxwell commercial? I think the majority of us wake up to an annoying buzzing sound. Anxious, gotta go, and not wanting to get out of bed. This is where you can start to make a change. Find the balance and the peace inside of you before you get out of bed. Start your day right. Find something to be excited about. Do you find peace in your bed or in your dreams? Why can't you bring this out to your waking life. How many of us feel so much at peace after a yoga class? The yoga high is a great feeling? What takes this high away? If we are annoyed during class we can drop it. If we do not get into a pose we accept it. We find balance in our poses and in ourselves. We leave the yoga class feeling great. What happens off the mat? I know off the mat that so many things can happen in life. Kids cry, people leave us, our bosses yell, soul suckers beat us down. We have too much on our plate or too little. We are too sad or too happy. This is life, it is part of the balance we need. We need to find that gentle side or more love for ourselves, or we need to push ourselves a little more. If all else fails, if life somehow finds a way to complicate things, Stop and Breathe. Ask yourself if it is going to matter in the long run. Are you creating the worry in your head? Is the outside world giving you this worry? Are you so used to having this worry in your head that you do not know what life is like without this worry. Look inside yourself and try to drop one of worry's now. Know that life will be OK if you stop worrying about this thing that you do not need to worry about.